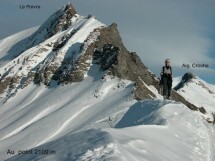 My friend Jean organizes a winter hike on Mount Vorès from Megève (75 km from Geneva) this Saturday, January 30. After a first part in the woods, we reach a view of Mont Blanc and Col Véry. Part walks on the Tour Beaufortain. The Mount of Vorès is located 200 m above.